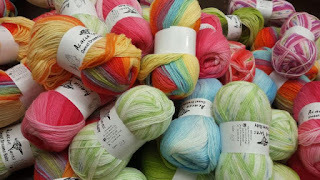 Are you ready for more Spooktacular sales on your favorites yarns? Hold on to your broom... we are lifting off for more fascinating facts about the Salem Witch Trials first, then onto the sale! Guilt ridden Betty Parris, daughter to Reverend Parris, was becoming very withdrawn and often appeared to be in trance-like states. She would be sitting with her needle work, and staring at the wall, and would be startled to the point of screaming when spoken to my her mother. When asked to explain her odd behavior, she would merely babble as her guilt would keep her from speaking openly. When in church she would sob openly over her Bible and this would draw unwelcome attention. Soon, the other girls began to act in a very similar manner as they also began to think about what their meddlings in black magic and the consequences when their parents/community found out. As the girls began to act out in multiple households, the entire Salem Village became aware of this "illness". A physician was called in and after working through his entire book of probably diagnosis and eliminating each - as the girls were all in very good health - he diagnosed the girls as being possessed by the devil. The village was appalled and eagerly searched for a scapegoat. In February of 1692, the Reverend Parris along with other leaders in the community began a pointed questionning of the girls. Eventually, after many episodes of acting out during the questionning, the girls became to talk and fingers were pointed. The community sighed relief as the first accusations of witchcraft in Salem Village were announced. Top of the list was Tituba followed by Sarah Osborne and Sarah Good. Oddly enough, Sarah Osburne was accused of witchcraft as she had not been attending church for over 14 months due to scandalous tattling by others regarding her living in sin with her future husband.... so she must be up to something. In actuality, she was bed-ridden and couldn't get to church. Sarah Good was accused because she was slovenly and a pest begging from door to door and usually found sleeping in hay mounds as she was married to a landless husband. Pity was not a virtue in the Puritan community so this was an easy way to place blame on those the community considered outcasts. In March 1-5, all three accused witches go before the magistrates and Tituba confesses to witchcraft. All three go to prison. Susannah Martin, hung from the gallows on July 19th for witchcraft and avid knitter and spinner is the ancester of Debbi B also an avid knitter and spinner... Is knitting and spinning hereditary? Debbi tells us that she is related to Susannah directly through her mother's father's mother's side. 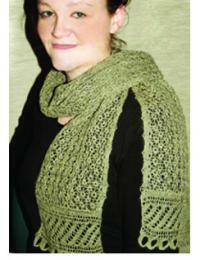 Did Susannah pass her love of knitting onto to her daughters grandsons greatgranddaughter? Do you think Susannah had her palm read by Tituba and was told to pass her spinning wheel and leftover wool to Debbi? I wonder if Debbi B goes into spells when her lace knitting doesn't quite go as planned? Do you think she will dress as a Knitting Witch for Halloween? Do you wonder who Debbi B is? If so, here is her blog link http://www.adayinthelifeofdebbi.typepad.com/. Thanks Debbi for sharing! And Finally - The Rules of the Sale:All items purchased on sale are final sales. Sale applies to in-stock items only. In the event that an item cannot be found in our physical inventory a substitution or refund will be offered. The sale discount cannot be combined with other discounts. Each weekday, a new sale will be announced through our blog at 12:00 EST. Please try to checkout by 11:59 AM EST to be sure to receive the sale price.